The 19th edition of the World Cup had many celebrities in attendance. But not all could be framed. Rediff.com takes a look at a few special guests who shutterbugs were more than happy to click. Actress Charlize Theron was seen watching the quarter-final between Germany and Argentina at Green Point stadium in Cape Town. 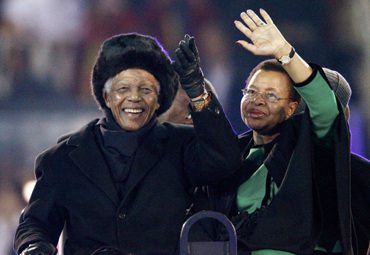 Former South African President Nelson Mandela and his wife Graca Machel finally made their entry at Soccer City stadium during the closing ceremony. Madiba was conspicuous by his absence in the opening ceremony. Mandela's 13-year-old great granddaughter was killed in a car crash after leaving a concert ahead of the World Cup kick off, the Nelson Mandela Foundation said. Mandela, 91, is widely credited with helping South Africa win the World Cup bid in 2004 and South Africans have been hoping he might be able to attend the opening match despite his frail health. Zenani Mandela, killed two days after her birthday, was one of Mandela's nine great-grandchildren. 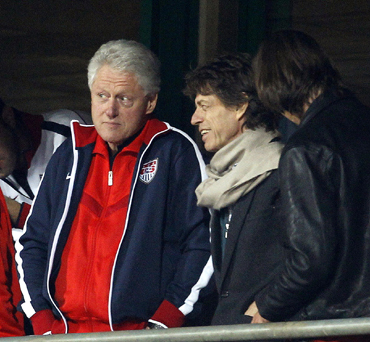 Musician Mick Jagger and former U.S. President Bill Clinton watch the second round match between the United States and Ghana at Royal Bafokeng stadium in Rustenburg. The Americans topped their group which also included favourites England. However, Bill couldn't ensure them luck and watched them go down 1-2. Sylvie van der Vaart, wife of Netherlands' midfielder Rafael van der Vaart, and Winona de Jong, wife of Netherlands' midfielder Nigel de Jong were seen taking a picture ahead of the final. Sylvie and Rafael are considered the Dutch version of David and Victoria Beckham. But Sylvie and Winona's presence couldn't inspire their hubbies to win it for the Dutch. 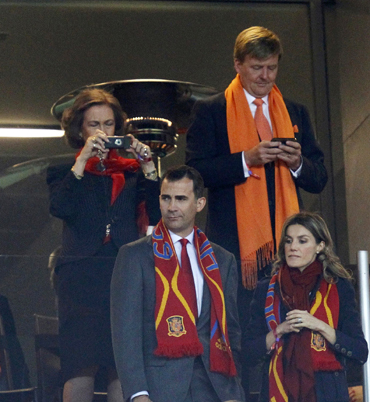 Spain's Queen Sofia and Crown Prince Felipe and Dutch Princess Letizia and Crown Prince Willem Alexander also made it to the final. But while it was ecstasy for the Spanish royalty, it was agony for their Dutch counterparts. The Netherlands lost in the final of the competition for a third time.